NGT expressed its anguish at the AAP government for not taking preventive steps to deal with air pollution and rapped it for implementing the odd-even scheme at the 'whims' of its officers. NEW DELHI: Courting controversies with orders on regulating Hindu pilgrimage to sparing none including Sri Sri Ravi Shankar's Art of Living for damaging the Yamuna floodplains, the National Green Tribunal in 2017 also castigated the NDA government for failing to rejuvenate the holy Ganga. Not only the verdict on Ganga brought embarrassment for the union government but the green panel's remarks that "non- cooperation" and "lack of will" of its instrumentalities were resulting in "inordinate delay" in cleaning the stretch of river Yamuna also put it on backfoot. While milestone judgements like refusing to lift the ban on 10-year-old diesel vehicle brought kudos from environmental experts, a pro-active NGT drew ire from Hindu religious groups for capping pilgrims at Vaishno Devi and asking devotees to maintain silence in front of the shivalinga at Amarnath. However, in the wake of protests, the tribunal came out with a clarification that there was no ban on chanting of mantras or performing of aarti inside the cave at Amarnath. Taking note of sound pollution caused by use of loud speakers at religious places including mosques, the NGT directed strict adherence to the guidelines on noise pollution and ordered action in case of any violations. It also took a tough stand on animal blood seeping into Yamuna and directed the authorities concerned to ensure that no blood is allowed to flow directly into the river due to slaughtering of animals. With the end of the year, the NGT witnessed its Chairperson Justice Swatanter Kumar retiring from his post after completion of his five-year tenure and Justice U D Salvi taking over the reins of the tribunal as the acting chairperson. Jantar Mantar, which for many years was the hotspot of all protests and dharnas, got rid off all such activities as the green body banned these saying that the state has totally failed to protect the right of enjoying pollution-free environment of the citizens living around the archaeological site, close to Connaught Place in the city. Notwithstanding deliberations on such issues, one environmental aspect which kept NGT busy was the deadly air pollution in northern India including the national capital prompting it to come out with the graded action plan. 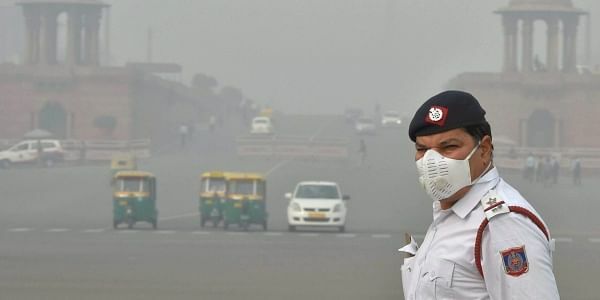 Worsening air quality in the national capital resulting in an 'environmental emergency' led the NGT to direct the Delhi, Haryana, Uttar Pradesh, Rajasthan and Punjab governments to submit action plans to deal with varying levels of air pollution. The tribunal expressed its anguish at the AAP government for not taking preventive steps to deal with air pollution and rapped it for implementing the odd-even car rationing scheme at the "whims" of its officers. Granting conditional nod to the AAP government's decision to implement the odd-even car rationing scheme, it ordered that no exemption should be allowed to "any person or officer and two-wheelers" and the scheme should be implemented automatically whenever the air pollution levels reaches the emergency levels. The NGT also voiced anguish for conducting the third Test between Sri Lanka and India despite alarming levels of pollution in the national capital. The Sri Lankan cricket team had complained of poor air quality that forced India to declare their innings. While dealing with the high and mighty, the tribunal refused to impose an additional environment fine on the AoL and ordered the DDA to use this amount to restore the Yamuna floodplains and bill the AoL if the cost is more. On Ganga cleaning which is one of the most ambitious projects of the Narendra Modi government, the NGT observed that the government has spent over Rs 7,000 crore in two years to clean river Ganga which still remains a "serious" environmental issue. The green panel, which delivered its verdict to clean Ganga, directed that 100 metres from the edge of the river would be treated as no development/construction zone between Haridwar and Unnao in Uttar Pradesh while in hilly areas it would be 50 metres. Slamming the stakeholders for the delay in completion of the 'Maily Se Nirmal Yamuna' programme, the NGT said the project was facing inordinate delay due to non-cooperation of authorities and lack of executive will. Expressing displeasure over the slow pace of the Yamuna rejuvenation programme, it said the ground reality shows that the project, which was to be completed by March 31, was far away from the target though some progress has been made in the first phase of its judgement. The tribunal struck a blow to the Environment Ministry by directing it to re-examine a notification exempting real estate projects with a built-up area measuring between 20,000 and 1,50,000 square metres from obtaining prior environment clearance, saying it suffers from legal infirmity. The MoEF, in an amendment notification published on December 9, 2016, exempted buildings and construction projects from the process of environment impact assessment (EIA) and prior environmental clearance. Quashing the provision in the notification which relates to the exclusion of "consent to operate" and "consent to establish" under the Water Act and the Air Act, the National Green Tribunal (NGT) said the stipulation with regard to constitution and functioning of environmental cell, to monitor adherence to the conditions in environmental clearance, cannot be sustained and are liable to be set aside.